So, it is the last day of February, and I am running late. I wanted to finish Ms. February’s sweater and do one more post for Black History month. Never in my life have I been so annoyed with the fact that February is such a short month! Well, the sweater will be finished this weekend. So today is the day I share the story of the Yes! 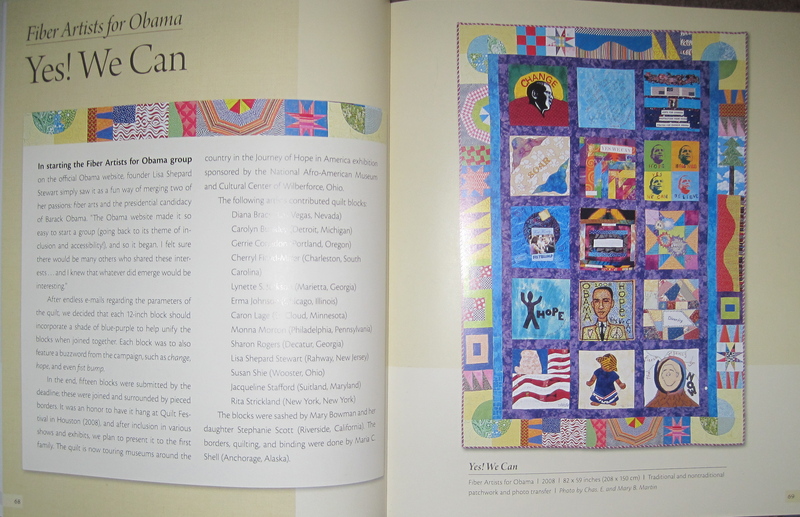 We Can quilt made by the Fiber Artists for Obama. President Obama’s 2008 campaign website allowed for individuals to form groups based on their shared interests, hobbies, and loves. 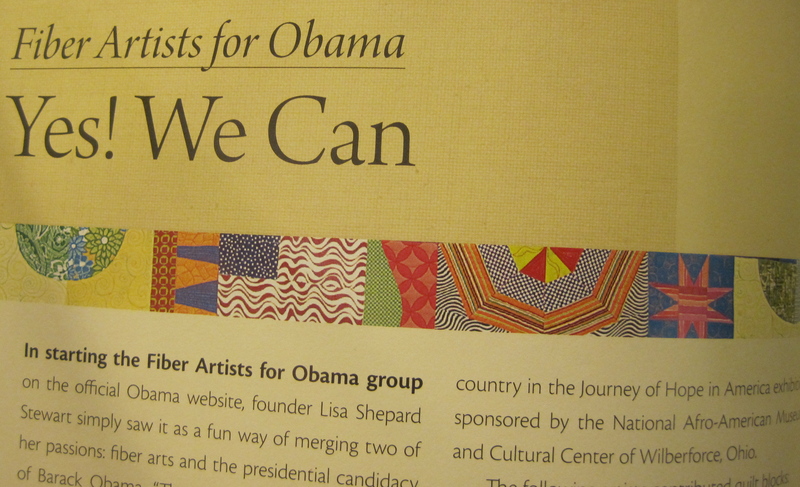 Artist Lisa Shepard formed Fiber Artists for Obama, and I joined the group. The group decided to create quilt blocks celebrating President Obama’s historic run for the presidency. We weren’t sure what would happen with the quilt–where would it go? what was the purpose? we didn’t know, we just wanted to make it. The blocks were gathered up and Mary Bowman and her daughter Stephanie Scott gracious worked to add the blue and purple sashings to connect all the blocks. This is the point where I joined the group, I did not make a block for the quilt, but I volunteered to quilt it. Diana Bracy, one of the artists involved in the quilt, and I had several phone conversations about getting this done. We really wanted to finish the quilt in time for the Democratic Convention in Denver, but it just wasn’t happening. I got the quilt and realized it needed a special border to tie all the different blocks together. One of my favorite aspects of this quilt is that it stitches women from all different backgrounds, geographic locations, and artistic talents all together in one quilt. For me, that is one of the great joys of community quilts. So, I got busy adding the final border. Using my bit bin, I added an assortment of color to the edge of the quilt. I think you all know what the next step is—quilting, quilting, and more quilting. The great thing about being the quilter for a community quilt is that as you quilt each quilters block you really get to know each person in the quilt. As usual, this quilting adventure took longer than I planned. And finally the finished quilt! 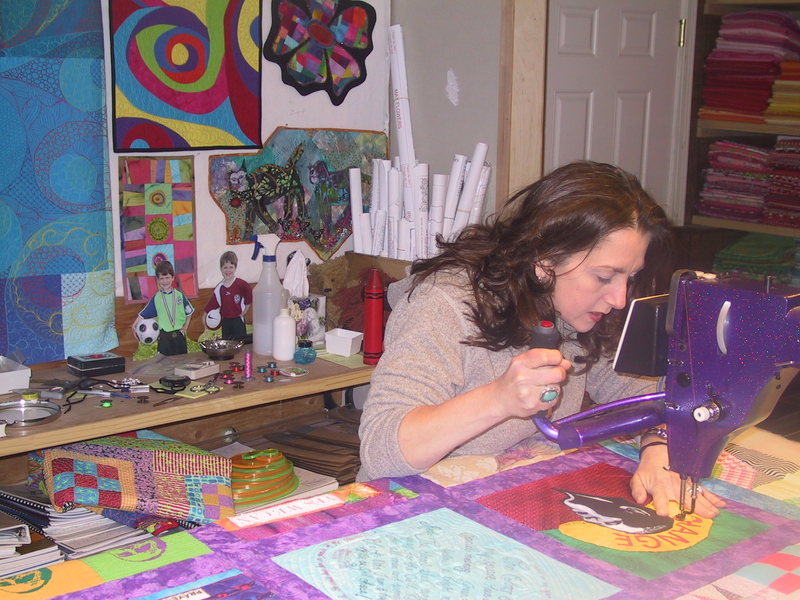 While I was doing all of this stitching, Diana Bracy was working with the International Quilt Festival to get the quilt included in a special exhibit they were doing that year called “Patchwork Politics”. Working against the deadline for that show, I stitched away. 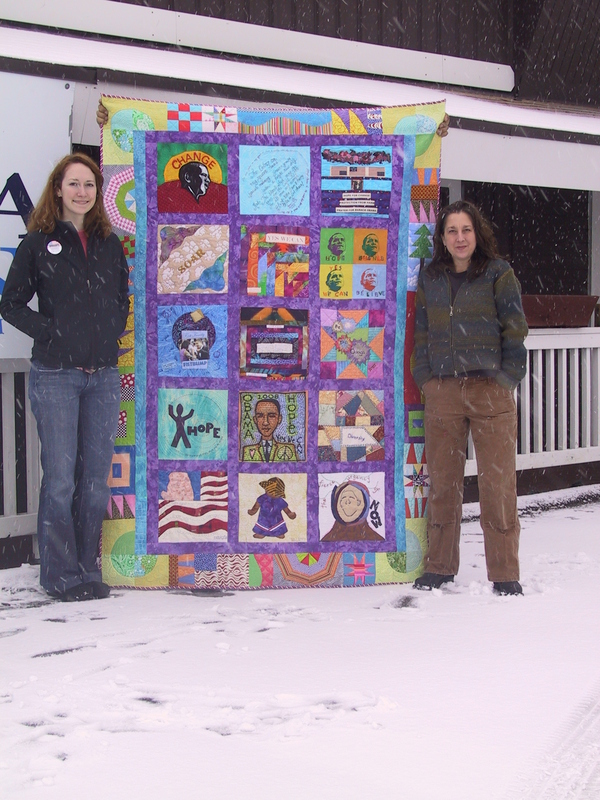 Once the quilt was completed, I headed down to the Obama headquarters in Anchorage, Alaska to show the quilt off. 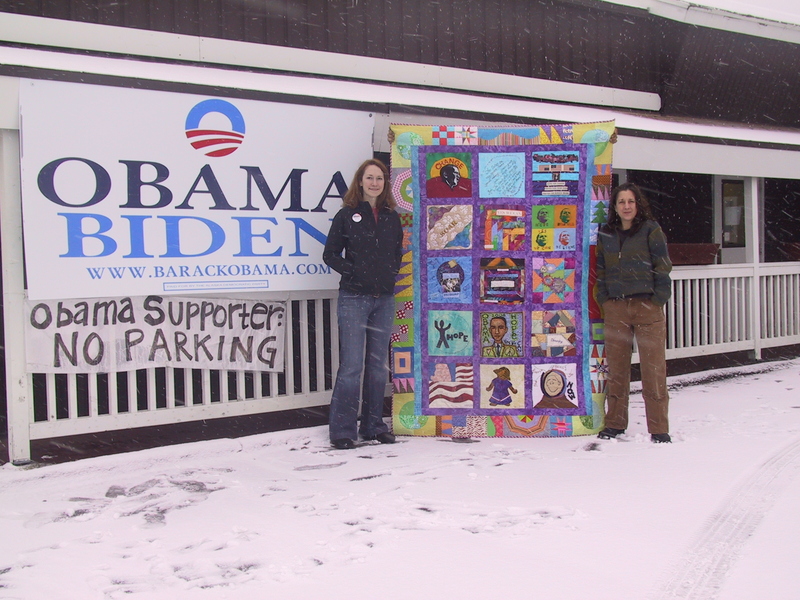 It was October and snowing ,but the campaign manager and I proudly displayed the quilt outside the headquarters. The volunteers in the Obama office loved the quilt. Here we are outside the Obama Anchorage Headquarters. Do you see the no parking sign? The McCain campaign was right next door, and they did not want Obama people parking in their spots. 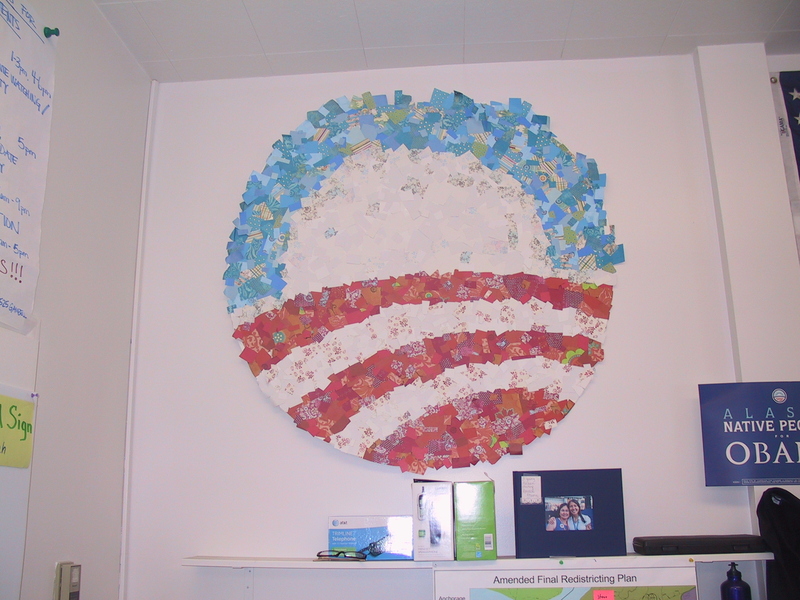 Some fun art work that was in the Obama Headquarters in Anchorage. Here is a closer shot so you can see the snow swirling. I hate it when it snows in October! 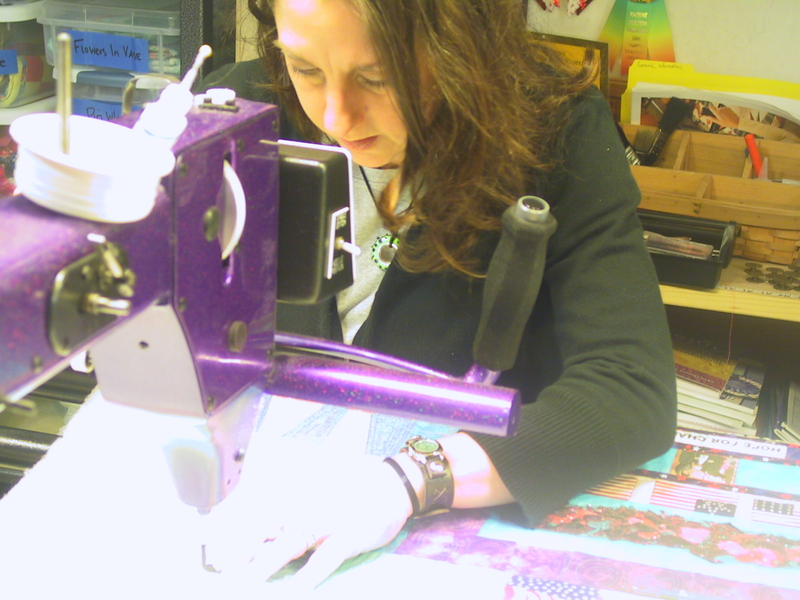 From there I headed to the post office to send the quilt to Houston for the Patchwork Politics Exhibit. Next the quilt went to Washington D.C. to be a part of a show curated by Sue Whalen called President Obama a Celebration in Art Quilts. My quilt Colors Unfurled was also part of that exhibit. 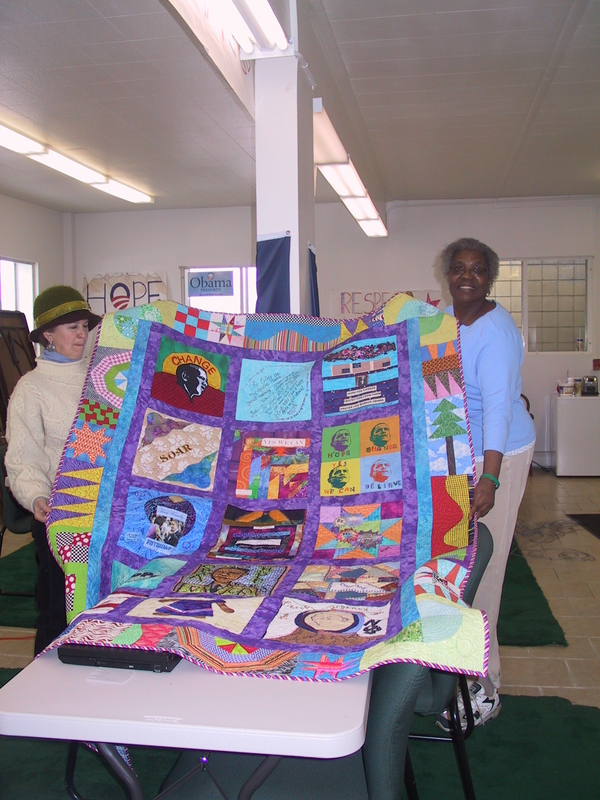 Then the quilt was juried into the exhibit Journey of Hope which was curated by Dr. Carolyn L.Mazloomi. If I have facts right, the show premiered at the National Afro-American Museum and Cultural Center of Wilberforce, Ohio. From there the exhibit travels as far away as Japan. 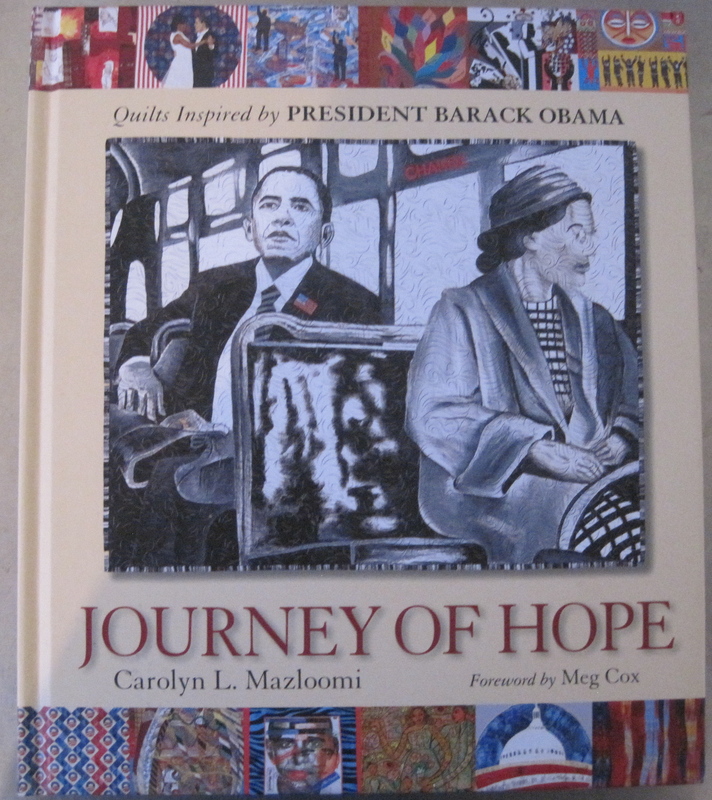 Dr. Mazloomi also edited a book about the exhibit called Journey of Hope: Quilts Inspired by President Barack Obama. This is the cover of the book. It is a truly beautiful book. Here is our page in the book. I like how they used the border from the quilt on this page. This quilt has so much history I almost forgot to tell you all that The Alliance for American Quilts interviewed most of the artists who participated in this quilt. I think of all the community quilts I have participated in this one has had the wildest journey. We hope someday to give the quilt to the Obamas, but we know they are a little busy right now. P.S. It’s Off the Wall Friday’s at Nina Marie’s blog. It’s a great way to see what other fiber artists have been up to this week. 28 Feb	This entry was published on February 28, 2013 at 8:11 PM. It’s filed under Quilt Stories and tagged Community Quilts, Yes! We Can. Bookmark the permalink. Follow any comments here with the RSS feed for this post. ohhh love a quilt with a meaning – no matter what your political leanings its great to see our art being used to express one of the things our country is great for – Our freedom of speech!! My signs quilt is my first foray into making a statement into social/political opinions – so this is really timely for me! What an amazing collection of talented ladies! Nina-Marie- I’m going to have to check out your signs quilt. thank you so much for Off the Wall Fridays. I look forward to it! I agree with community quilts are especially fun to make! Yours truly has an inspirational meaning, and achieved so much success. Thanks for sharing all about it! Come see me at “Off the Wall Friday!” too.